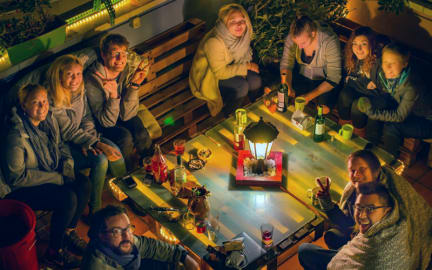 Hostel One Sants has a great atmosphere and is an easy place to meet other people. We offer a wide range of activities and special events throughout Barcelona, as well as free entrance to the best clubs in Barcelona. So what are you waiting for! Book now and become part of the Hostel One Family! Hostel One Sants is not just a hostel. Its a place where you are gonna feel the same comfort and liberty as if you were in your own home, but in Barcelona! From the minute you walk through the doors of Hostel One Sants, you will immediately feel our family vibe and atmosphere. We look after each guest as if they are an old friend coming to visit – and even provide you with a FREE home-cooked dinner every single night! Yes that is right, FREE! 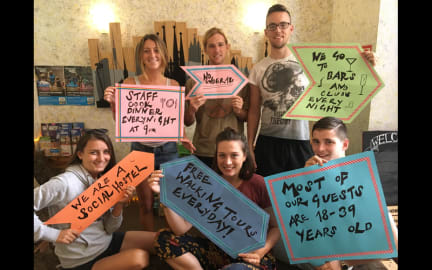 Not only we are here to feed you after your long day of exploring this beautiful city, we want to make sure you have just as much fun with the hostel and meet as many people as possible! That is why we also provide free day activities and epic bar crawls every night. With our beautiful rooftop terrace, large basement area equipped with pool table, reading corner, TV with Netflix and PS3 and along with our reception and 24 hour kitchen common area, you should have no problem slotting into our beautiful family and making new friends. We have rooms for two, three, four, and six people. All the rooms are accessible by elevator. Toilets and showers are available on every level. We also have free internet access, as well as Wi-Fi for your personal devices. There is no curfew, so you can come and go 24 hours per day as you please. Hostel One Sants is an easy 12-minute walk from Sants Station, the main train station in Barcelona. We are also very close to Camp Nou, Barca´s football stadium, and near Montjuic, Barcelonas largest mountainous park. Es war ein unvergesslicher Aufenthalt! Die Atmosphäre war direkt familiär und entspannt. Es war kein Problem Anschluss zu finden durch die täglichen und nächtlichen Aktivitäten sowie das kostenlose Abendessen, welches jeden Abend stattgefunden hat. Ich kann das Hostel nur weiterempfehlen und werde definitiv wiederkommen!!! Danke für die wünderschöne Zeit!! I honestly think this might be the best hostel I've stayed in! Regards to the super-friendly staff & all the volunteers - you made it a pleasant stay ! It's a small hostel, but with a super-nice family atmosphere. Free dinner, daily activities, breakfast, drinks for purchase, ... Well located to Public Transportation in the calm area of Sants. Would come back anytime! very good hostel, especially if you‘re looking to meet some new people plus it‘s close to the station Sants. I would definitely recommend it! So, this is my first review ever and I have to say that I had an amazing stay at this hostel. The staff was super friendly especially Alex who could answer all our questions and took time for us (and we had a lot of questions I guess). Atmosphere was also very good, I’ve met great people there. I’d come again anytime. Thank you! Super nettes Personal, jeden Abend wird gekocht und zusammen ausgegangen. Perfektes Hostel für Solo Reisende!